Rogers’s first introduction to the organ was through Philadelphia’s Jimmy McGriff. The legendary jazz organist had a relative that lived just a few doors down from the Smith’s. During a visit, Roger was introduced to a sound that fascinated him -the Hammond B-3 organ. Jimmy McGriff taught him a couple of signature blues songs, “Down The Road A Piece” and “Little Red Rooster”. From that time on, the Hammond organ became an important part of Roger’s life. 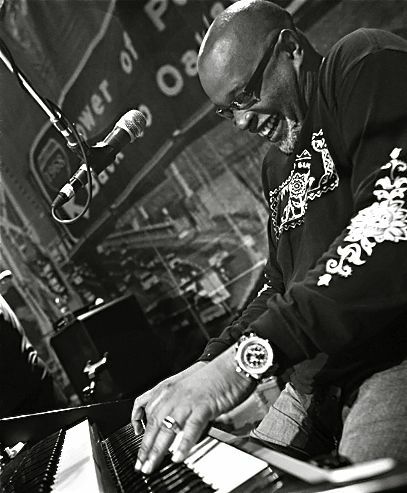 Smith’s virtuosity on the Hammond B-3 is complimented by his diverse resume. He’s played with Jeff Beck, Gladys Knight, Freddie King, Willie Nelson, and Leon Russell, recorded with the great Poncho Sanchez and The Dave Matthews Band among others. At Present, Roger holds down the Hammond B-3 seat vacated by the formidable Chester Thompson with the legendary West Coast soul band Tower of Power, maintaining its signature sound with his expert organ play.